In the early part of the twentieth century, bald eagles commonly nested along Georgia’s coast and in the Okefenokee Swamp. Occasionally, they nested elsewhere in the state, likely in major river swamps and depressional pond and wetland systems in the Coastal Plain. By the late 1950’s, eagle numbers had declined, and the species was no longer considered common. By 1970, there was only one known successful nest, and it was located on St. Catherine’s Island. A successful nest is a nest that has fledged at least one nestling. In the decade that followed, the bald eagle was described as a rare transient and winter resident. There were no known nests in Georgia. As with eagle populations elsewhere, the mortality rate and lack of reproduction that resulted in this decline were likely the result of habitat loss and environmental contamination by DDT and other toxic chemicals. DDT use was outlawed in the United States in 1972, and the federal Endangered Species Act (ESA) was passed in 1973. That same year, Georgia enacted the Endangered Wildlife Act, which allowed listing and protection of rare animal species. Bald eagles were added as endangered species to Georgia’s Protected Wildlife List in 1974. After several years with no known nesting activities, an occupied eagle nest was discovered on Georgia’s coast in 1978, and by 1981 there were two known occupied nests. Georgia DNR started releasing young eagles in 1979. The birds were obtained from captive breeding facilities and wild nests in states where the birds were more numerous. Sapelo Island was the initial release site, and the program was later expanded to Butler Island and Lake Allatoona. Eighty-nine eaglets were released via a “hacking program” through 1995, but it is not known if this was a significant factor in rebuilding the nesting population. The nesting population of bald eagles in Georgia has continued to grow, surpassing 100 occupied nest territories in 2007 and more than 200 nest territories in 2015. The 2017 surveys documented a record 218 nests at least 142 of which were successful. In 2018, DNR downsized surveys from statewide to covering half the state each year. 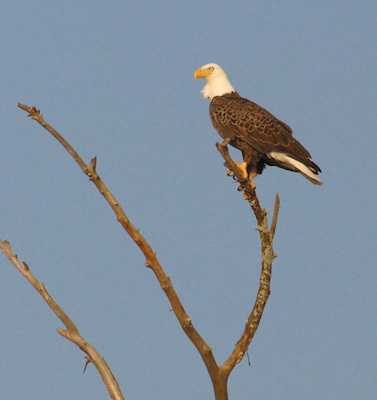 Nearly 110 eagle nesting territories in the six coastal counties and an area bounded roughly by interstates 16 and 85 and the South Carolina line, were documented. Those nests fledged an estimated 127 young. The survey change maintains standardized monitoring, syncs with the species’ range-wide comeback and mirrors slimmed-down eagle nest checks in some neighboring states. It also frees money for other needed conservation projects. Conserving bald eagles remains a priority. The species is state-listed as threatened and a species of conservation concern in the State Wildlife Action Plan. Survey leaders determined that halving the effort would not compromise DNR’s ability to identify and address any decline in productivity of our nesting eagles. That consideration was the most crucial for the change. Northeastern area (I-16 to the south, I-85 to the north and west, and the Savannah River to the east and northeast, excluding Savannah): 28 occupied nest territories, with 19 fledging at least one eaglet (68 percent success rate) and 32 young fledged (1.1 per occupied territory). Notes: Three to four nests were either substantially damaged or destroyed by Hurricane Irma last fall. However, 11 new nests were found, including five on the coast. One was the first known ground nest of a bald eagle recorded in Georgia. It was made in the wrack on Cabbage Island, southwest of Tybee Island. Unfortunately, the nest failed sometime in late March. Bald eagles usually lay two eggs per nest, but occasionally they lay three. Annual nest success ranges between 65–80 percent. This iconic species is known to nest in nearly 70 counties in the state. One-third of the nests are found in the six coastal counties, but territories are now found throughout much of the state where there is sufficient open water habitat and large trees for nesting, particularly along the lower Chattahoochee and Flint River corridors. Most nests are isolated from human structures and human disturbance, but a few eagle pairs have chosen to build nests in trees located a short distance from houses and highways. About 95 percent of nests are built in living, mature pine trees. To-date no bald eagle nests in Georgia have been found on man-made structures, but the similar-looking osprey routinely nests on bridges, poles, navigational markers, platforms, and cell phone towers. Bald eagle nests are monitored in January to determine occupancy, and again in March or April to determine productivity. Most nests are monitored via helicopter surveys, but a few are monitored from the ground, often with the aid of volunteers. Additional nests are discovered each year through limited aerial searches and through reports from the public. By late winter most nests are home to young eaglets ranging in age from 4–14 weeks, or they are empty because the nesting effort failed or, in a few instances, the eaglets have fledged. There is a marked latitudinal gradient with regards to the timing of the nest cycle in Georgia. Eagles on the coast nest earlier and fledge young earlier than those in the mid-state, and much earlier than those nesting on the perimeter of reservoirs in the mountains. The causes of failure for eagle nests are varied as they are with all birds, including severe weather, death of one or more of the parents, insufficient food available (they mostly eat fish) to rear young, and predation of eggs and young by raccoons, great horned owls, and other wildlife. Annual monitoring also helps DNR to identify potential threats to eagle nests, as well as management needs. Resolution of habitat management conflicts on private property is a top priority. Recommendations based upon the federal management guidelines are adapted as suitable at each nest site to prevent harassment of the eagles that could lead to nest abandonment or nest failure, while also minimizing landowner restrictions. The U.S. Fish and Wildlife Service downlisted the bald eagle to threatened in 1995, and in 1999 proposed that it be taken off the Endangered Species List. In 2007, the bald eagle was removed from the federal list of threatened and endangered species. The species is still listed as threatened under Georgia's Endangered Wildlife Act, and is protected at the federal level under the Bald and Golden Eagle Protection Act and the Migratory Bird Treaty Act. DNR does not have a good estimate of Georgia's actual eagle population, which tends to increase during the late fall and winter months with the arrival of wintering eagles from the northern U.S. Protections afforded to the bald eagle under the Endangered Species Act have been largely responsible for its inspiring recovery in Georgia. However, there continue to be reasons for concern. Avian Vacuolar Myelinopathy (AVM), a disease of the central nervous system, has resulted in the deaths of eagles and abandonment of nest territories at Lake Juliette and the lower part of Clarks Hill Lake in recent years, and could have a devastating impact if it spreads to other sites. Research has determined that a toxin found in certain species of photosynthetic bacteria (a “cyanobacteria”) causes the disease. This cyanobacteria has been found growing on hydrilla, an invasive species of submerged aquatic plant. American coots, which winter in large numbers in Georgia on reservoirs, forage on hydrilla, thereby ingesting the toxin in the cyanobacteria. The resulting symptoms include incoordination and an inability to fly, making these birds easy prey for eagles, which, in turn, ingest the toxin. To-date this problem has remained fairly localized. There are unfortunate downsides that come with an increased eagle population such as more birds being hit by cars as the eagles, mostly sub-adults, eat roadkill, incidents of eagles being shot, and birds dying from lead poisoning when they scavenge carcasses of deer containing bullets.